promotes its tourism to the world. We also offer the opportunity to discover enigmatic destinations ranging from transparent lagoons, amazing caves, stunning mountains, pristine beaches and friendly people of Mexico Magico today. It is one of the most fascinating natural attractions of the state. It is located near the town of San Gabriel in Ixtlahuacán, from which an adventurous route full of colorful landscapes and begins to reach the cave. That's easy to marvel at the impressive rock formations and stalactites that have formed over thousands of years of filtration and vestiges of indigenous presence in the past used this room as a ceremonial center which still survives the access stairway . In the lagoon La Colorada, adjacent to the Laguna de Alcuzahue, is this crocodile sanctuary, called the Crocodile Farm, where specimens of various sizes and ages in captivity are exhibited, as well as another large numbers in their natural habitat in the lagoon. Founded in the early 80's, today it has expanded and remodeled, adding an outdoor theater, a natural museum and ample parking with health services and surveillance. It also has an explanatory three-mile trail circling the lake Sanctuary. This tour allows visitors to enjoy the beautiful offering this distinctive area of ​​Colima. The old Hotel Casino, a traditional house dating from 1848, whose original owner was Mr. Juan de Dios Briezuela is today, this museum houses the most distinctive regional history through two major collections: Stavenhagen and Velasco Curiel, which were donated to the formation of this cultural space. You have also added, Colima archeology collections and region, as well as an interesting collection of nineteenth century European furniture. This space is a must to empathize with the history of Colima people. Situated on the border with the Mexican state of Jalisco, Nevado de Colima National Park is home to the volcano of Colima Volcano of Fire, major tourist attractions for adventurers and experienced mountaineers from around the world. With an area of ​​22,000 hectares, this park also offers visitors beautiful scenery of pine, cedar, canyons and lakes that can be visited in strict accordance with the directions of authority. In the period between 1100 and 1400 AD flourished complex called El Chanal. Its inhabitants belonged to a pre-Hispanic culture, which could not yet determine their origin or cultural affiliation. What we do know is that they were devotees of the god Tlaloc, god of rain, which many representations exist in the ruins of this social center with plazas, ceremonial centers, shrines and courtyards to the ballgame. Another important archaeological sites in the region of La Campana. Belonging to the settlement of Almoloyan, it is believed that their civilization disappeared during an earthquake. In addition to the archaeological ruins were altered by the Spanish conquistadors and missionaries to take part of their materials for the construction of the new mestizo communities. The fluvial drainage, avenues, high walls and rooms are built on platforms historical legacy of civilization that we know today only practiced agriculture and trade. Historic Monuments Zone declared by the state, this picturesque town retains its provincial air with plazas framed with large arches and white houses with red roofs. 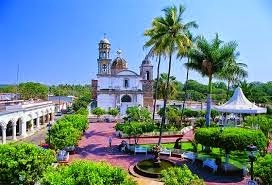 Also known as "White People in America", Comala is a quiet community surrounded by lush vegetation fed by Suchitlán, San Juan and Barragana rivers. With more conducive to "fly" throughout the year taking off from Cerro Summit Hill or Juripiche winds, Colima has an international reputation in the practice of hang gliding and paragliding.